MEDFORD -- The ornate Alden chamber at Medford City Hall buzzed with anticipation. After months of mostly ignoring his earnest and relentless opponent John Bonifaz, Secretary of State William F. Galvin had finally agreed to debate him, at a candidates' night, Medford Democrats said. Bonifaz arrived early, primed for combat. ``A person who holds that post ought to know how important debates are," he said. ``I'm glad he's joining me tonight." The 7 p.m. start time approached. Galvin had not appeared. Everybody anxiously eyed the clock. The minutes drained away. Finally, at 6:50, organizer Joyce Ball urged Bonifaz to take his seat. Bonifaz hesitated, still watching for Galvin. ``It's late, and I don't know where Mr. Galvin is," a worried Ball said, adding, ``You'd think he would have called or something." So Bonifaz took the stage alone -- again. The candidate, whose smooth face, slight build , and too-big suits make him look far younger than his 40 years, launched into a passionate critique of Galvin, contending that the secretary of state has run elections in the state in a way that results in low voter turnout and protection for incumbents and moneyed interests. Then his two minutes were up. 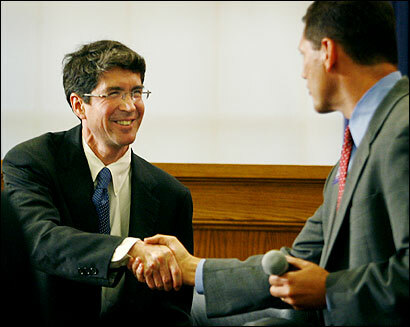 John Bonifaz, recipient of a MacArthur ``genius" grant at age 33, Brown - and Harvard-educated, nationally known for his groundbreaking legal assaults on the current electoral system, now finds himself trying to break into a seemingly impenetrable universe: Massachusetts Democratic politics. It seems at times like a ``Roger & Me" candidacy. He appears at forums all over the state, hoping for a back-and-forth with the secretary. Galvin, the enduring Boston politician, with an enormous campaign account and a formidable list of allies, deals with Bonifaz by rarely dealing with him at all. And just as filmmaker Michael Moore's inability to win an audience with General Motors CEO Roger Smith became the thrust of ``Roger & Me," the 1989 documentary that made Moore's name, Bonifaz's inability to get Galvin to pay him any mind has started to define his campaign. ``Secretary Galvin's absence here tonight is par for the course," Bonifaz said in his opening statement in Medford last Wednesday evening. ``It speaks volumes as to his failure to live up to his responsibilities as chief elections officer of the state." Galvin, in an interview, seemed both puzzled and incensed by Bonifaz's attacks on him, which he said brim with ``wild charges" and ``misstatements." Although the Medford Democrats said Galvin called just before 7 to apologize that he was ``stuck in New Bedford" and could not make their event, Galvin had told the Globe earlier Wednesday he had never agreed to appear in Medford. The secretary says he has attended plenty of events where Bonifaz was also present, though he acknowledges none followed the ``classic debate format." ``We have been at Democratic forums together many times, going back to January," Galvin said. Galvin is unused to challenges. A former legislator from Brighton, he has not had a primary opponent since he won the secretary of state's post in 1994. With an encyclopedic command of the state's political landscape, from the voting history of wards and precincts to the vulnerabilities of obscure mayors, he relishes the electoral nitty gritty. Popular with unions and Boston voters, his last two election victories have been landslides. Galvin at times seems to view the Bonifaz challenge as an annoyance. Party activists said Galvin lobbied other Democrats to deny Bonifaz the 15 percent of delegates' votes necessary to get on the primary ballot at the Democratic State Convention in June, but Bonifaz drew 30 percent of delegates. Now that Bonifaz is on the ballot, Galvin, a veteran of Massachusetts politics, has enormous advantages: he has amassed about $1.8 million in campaign cash as of mid - August, and allies in the Legislature who can mobilize votes for him. He is unlikely to spend most of that money. He has a tiny campaign staff, and most of his appeals for votes have been made in mailings to Democrats. By contrast, Bonifaz, who is running for his first office, had about $10,000 in his campaign account as of mid-August. Though Galvin is likely to be reelected, there are good reasons for him to avoid direct debates with Bonifaz, which would only raise the visibility of a race few voters have been watching . For Bonifaz, the secretary of state's office is an avenue to put into practice the ideals he has fought for in the courts: voter enfranchisement, easier access to the ballot for non-incumbents, and grass roots democracy. The Delaware-born lawyer blames Galvin for low voter turnout and reports that some non-English speaking voters have been turned away from the polls. He also says the secretary of state should have been a champion of the Clean Elections law, which would have provided public funds to candidates. The Legislature balked at providing the money. Galvin vehemently rejects the claims. He says he has added 1 million new voters to the registration rolls, and has exceeded federal requirements for non-English information at the polls. He also calls Bonifaz a one-issue candidate, fixated on elections and ignorant about the broader duties of the office. ``I don't really want to talk about him," Galvin said. ``He has made many dishonest statements about elections . I've tried to correct them as best I can. The facts of my record are verifiable. He has a lot of fantasies." Though he has mostly ignored Bonifaz, Galvin has leveled one accusation repeatedly -- that Bonifaz is no Democrat at all. Galvin points to a Boston voter registration card Bonifaz filled out in 2000 on which ``Green Party" was written on the line for political designation. But on the same card, Bonifaz appears to have checked ``unenrolled" for his registration. Bonifaz says that he has never been a Green Party member, and has voted in every Democratic primary. ``He's a machine politician," said Bonifaz. ``I'm a public servant." So far, such exchanges have been made mostly under the radar, despite Bonifaz's best efforts. So low profile is the secretary of state's contest that sometimes even Galvin has trouble holding voters' attention. Appearing at the Summerville at Farm Pond Retirement Community in Framingham last Thursday, Galvin introduced himself and launched into a long list of achievements relevant to the retirees, including protecting investors from unscrupulous banks and brokers. ``I've been on your side," he told the 25 men and women seated before him. ``I'm a newcomer," one woman asked after his pitch. ``I don't know who you are or what you're running for." ``My name is Bill Galvin," he said patiently, and started over: He is in charge of elections, enforcing freedom of information laws, historic preservation, and keeping track of money spent by lobbyists. The meeting broke up because the Yiddish Club needed the room. As Galvin was shaking hands, one woman looked happy to meet him, but she had a question. ``What's your name again?" she asked.